I see the focus on small and mid-sized groups as an effective strategy to build local community groups, and encourage grass-roots organization to change the dynamics of the industrial food complex. I also see it as a reflection of planting and saving open pollinated seeds. When you plant and save open pollinated seeds, you're preserving biodiversity at the local level, you're ensuring local food security, and hopefully, trading seeds with other members in your community to keep open and free access to seeds. Seed Matters™, an initiative of Clif Bar Family Foundation, today announced four new fellowships totaling $500,000 awarded to Ph.D. students studying organic plant breeding in North Carolina, Texas, Washington and Wisconsin. The five-year grants are designed to help narrow the funding gap between plant biotechnology and organic seed research by supporting the next generation of organic plant breeders. Ryan Gregory, whose research at Texas A&M AgriLife Research in Lubbock and Texas Tech University, is focused on breeding cotton for drought and salt tolerance, but is also developing efficient methods for screening conventional and organic cotton for contamination from genetically modified organisms (GMOs);Zachary Jones, whose work at North Carolina State University is breeding organic corn varieties to resist contamination from genetically engineered corn pollen;Claire Luby, who is breeding organic carrots at the University of Wisconsin-Madison and examining the impact of patents on plant genetic diversity; andLouisa Winkler, whose work at Washington State University will involve the breeding of new organic oat and wheat varieties to enhance economic and environmental performance in western Washington. That's quite impressive to me. For too long the focus of federal funding has been on conventional and genetically modified methods, while organic methods suffers. That funding ratio has to change. I believe it can, and the outreach to small and mid size groups by the CBFF will go along way to making that change happen. Update 9.29.13: This recipe freezes well too, so if you're at the point where you have a lot of green tomatoes because your tomato growing season is coming to an end, here's an option for you to enjoy the fruits of your labor this winter. Thanks Beulah for the update about freezing this. I tried freezing this earlier this summer with the batch mentioned in the first update that follows, so it's always good to see that I'm on the same page as my readers. This is a post from 08.04.12, just about a year ago. It seems appropriate since I will doing this today. I'm running 50/50 with ripe tomatoes and green tomatoes. Yesterday was a bumper crop of green ones, Golden Milano plums to be exact, which are too small to make friend green tomatoes out. I already have some green tomatoes pickled, so this is the next logical step. Enjoy! As published 08.04.12 with slight revisions. I'm a little busy right now, and unfortunately, the garden has fallen down the list of priorities. I will be a vendor at The 2nd National Heirloom Expo in Santa Rosa, CA, September 11-13, 2012. Shortly after that, I will be part of the international press covering, Salone del Gusto Terra Madre, in Turin, Italy October 25, 2012 - October, 28, 2012. Not to mention the day job, 2 hours commuting everyday, and all the activities associated with life, e.g. laundry. My garden is not located on my property. I have a community garden plot about 10 minutes from my house that I have to haul everything to and fro, including water. Even though I store water there, the water still has to get to the storage container. I need approximately 60 gallons at a time. It's a challenge. Especially with the water and with the heat and flirting with drought here in my corner of southern New Jersey. Recently, I stopped by just to see what was up. It had rained, or stormed is more like it since rain just doesn't exist with the new weather, so I was off the hook for a bit with watering. When I got there, a branch of a lush Ramapo plant, a New Jersey heirloom, had split from the force of the weight of the green tomatoes. My lack of time contributed since I didn't keep up with securing the new growth to the stake, and then there was the power of the storm. The tomatoes were too small to fry, and not really enough to pickle. Not one to waste the gift of food, I knew I could do something with them. So, while driving home with the green tomatoes, I thought, when in doubt, roast. From my harvest that day of ripe tomatoes and eggplants, I was going to make a fresh tomato sauce with eggplant, and to that, I would also add the roasted green tomatoes. I remembered earlier in the day, I had bought some sigi olives, otherwise known as oil cured sicialin olives. They are dry cured black olives that soaked in oil. The flavor is robust and dense, and they can be very salty. The dry curing intensifies all the flavor and removes the moisture. They have pits, and for some, the flavor, is overwhelming. Good, cured olives in tomato sauce is always a favorite of mine with pasta, so now, the black olives were going into the sauce too. I was all set in my mind until I started to cook. Always one to experiment, I decided to roast the olives with the green tomatoes. I would add some Italian sunflower oil, which is superb, salt, fresh garlic, some fresh lemon juice, and hope for the best. As you can see by reading this, it worked because I'm sharing it with you. Roasted them for about 12 minutes, removed them, and placed them in a bowl where I tossed them again. When eaten together, the moisture from the roasted tomatoes, along with the oil, mellows the intense flavor of the dry cured olives while adding a slight tang, that a green olive would have. The textures blend into what one would expect from olives. Hence, faux green olives. Since making pasta with black olives was what I started to do, decided to add the mixture to the sauce I created with french fried eggplants and freshly picked tomatoes. I love my garden. Right before the pasta was done, I added the mixture with the eggplant, which I french fried, to the tomato sauce, which I tossed with a wonderful organic, Italian glutten freen pasta by BioNataure. I have to say, I was very pleased. Let the faux green olive mixture marinate in the refrigerator for a couple of days, and the green tomatoes really pick up the olive flavor. It makes a nice tapenade also. I'm so glad I discovered this. I found another branch spilt from a second Ramapo plant. Can't wait to see a ripe Ramapo will taste like. All in good time. Time now for me is lacking. Time though is a great equalizer. We all get 24 hours in a day. How we shape it into our own story defines who we are. It's been an odd gardening season this year. It started out nice in the spring, and then some light frost in the middle of May, with a really nasty cold windy Saturday of the Memorial Day weekend. That ushered in thirteen inches of rain in June, followed by some wicked heat, and a few days of 4 inch rains, and a lot of humidity. We haven't had a good stretch of dry weather all summer. The spring harvest was good, but I had eggplants before my early tomatoes. I had early tomatoes on my Hawaiian Pineapple tomatoes before the early tomatoes set. These Hawaiian Pineapples are a very late season variety, 93 days for crying out loud and the plant set a tomato in early June. It's now the start of August and about 15% of my tomatoes haven't set fruit, and another 15% is just starting. The Golden Milanos, a yellow version of Roma Plum, though have been a bright spot. They are a F1 hybrid, not an heirloom but that's fine by me. My local supermarket was selling local vegetable plants in the spring, and of course I stopped by to check them out. When I saw these, I just had to have them. I don't grow many plum varieties, and to have a locally grown yellow variety staring me in the face. well, I had no choice but to try them. The fact of the matter is, I've had yellow plums in the back of my head for a couple of seasons. I just never got the seeds. These plants are VF which means they are resistant to V = Verticillium wilt and F = Fusarium Wilt. And they are. I've had a season of battling both, and these plants just laughed it off. The plants are short and bushy. They are very prolific, and like most yellow tomatoes, they have a mild, acid free flavor, They grew rather large, and they are meaty. They roast really well, they make a nice sauce. I like them and would consider growing them again, which considering the general lack of interest I have with plum tomatoes, that statement is golden. I hope you see what I just did there. The indiegogo project isn't go going, That's because I haven't been pushing it. Please take a look, and if so inclined, please share it with folks you know. The reason I haven't been pushing it is, there's a lot of other things happening, and I'm one person here. The seed catalog is therefore a current encyclopedia of gardening, revised and brought up-to-date each year. Some are so complete as to be the prefered reference books in agricultural schools. I had this idea before I came across this almanac in a used book store. When I read that, I knew I was on the right track. This map will provide a detailed historical record for the Library Seed Bank. The libraries who participate will have guidance to find the seeds of local varieties if they still exist. This map will free, and openly available for everyone. There will be an app coming out this too. I will doing research at the Smithsonian Institute this summer! They have an extensive collection of seed catalogues that don't circulate, and are viewed by appointment only. I have a contact with a senior research librarian there, so that's exciting. My daily work contract is up in a month so the timing is fortuitous. Already this project has inspired a teacher to establish a seed bank at his school. His class this fall will help me with the seed map. The plans for the first seed bank at the McGowan Memorial Library are moving along. There is a big craft show on September 21, 2013. It's a tradition for many, and draws a big crowd. I will be there doing a soft launch of the seed bank. And yes, I'll be giving out seeds. The mayor of nearby town is very interested in the idea of a seed bank as community outreach through an arts organization in his town. This is good. It's always a benefit when the mayor likes an idea. I have an idea to tie in tasting with the heirloom vegetables I grow as a way to demonstrate to people the value of heirloom seeds. Slow Food International says it's all starts with a taste. And it truly does. They inspire me, and I do agree with that statement. Give someone a taste and you have their attention. This is all coming together organically, and I wouldn't have it any other way. So, after all the impressive progress is noted, here's the big plug at the end to help support the growth of the Library Seed Bank. 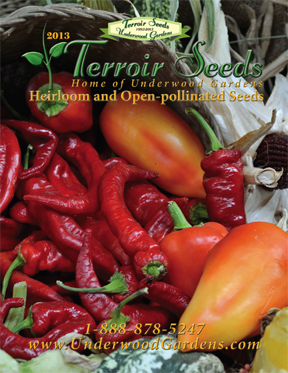 If you have old seed catalogs, or if you know of local seed companies, please let me know. You can leave a comment, or use the contact form. I steer clear of activism here for a number of reason, today however will be an exception. My friend Gail and I were discussing the recent detrimental decisions of the Environmental Protection Agency(EPA) concerning the plight of bees. We decide to work on a White House petition together. When I went to set up our petition at the We the People page, I found an existing petition. While our petition would've been directed at the EPA, this petition is great. I encourage you to sign it, and share this petition with your network. As I write this post, 98,415 more signatures are needed by June 27, 2013 to get a response for the Obama administration. With your help, this can happen. Notifying known beekeepers within 1 mile of the treatment area 48 hours before the product is applied will allow them to take additional steps to protect their bees. Also limiting application to times when managed bees and native pollinators are least active, e.g., before 7 am or after 7pm local time or when temperature is below 55oF at the site of application, will minimize risk to bees. This is not acceptable, especially since bees are under enormous environmental pressure now. Last week, CBS News "checked in" with EPA about its review. The agency's response: it "should be completed in five years." Which means at least another half-decade of vast swaths of lands planted with neonic-treated crops. Again, not acceptable. While Europe moves sanely ahead, the EPA here in America is remiss in their duty to protect the environment. After all that the bees do for us, isn't it time we stood up for them? Here's a press release from the American Bird Conservatory for the study cited in this petition. Help me establish seed banks at public libraries by supporting my Library Seed Bank indiegogo project. I also have a blog set up for the Library Seed Bank. I will be cross posting between the two blogs as about the progress. The indiegogo option I chose was to accept funding even if I don't reach my goal. Unlike Kickstarter, where you have to reach your goal to get the funds, indiegogo allows you to accept all donations if you choose. My first priority is to set up a nonprofit so I can get grant, and accept donations. Everything else after that is icing on the cake. My first seed bank goes in at the McCowan Memorial Library in Pitman, NJ. I have a couple other leads that I'm following up on, so I will let you know if they happen. Please share the link for this project if you feel comfortable doing so. It's a tremendous opportunity to create a community-based structure to preserve local heirloom varieties of plants, and local gardening knowledge. Information and agriculture have sustained society from the start. Now, with the Library Seed Bank, we can bring the two together as an heirloom social structure for future generations. The pace is quick, and I'm slowing down due to the fact that I'm not as young as the day before. This is not a lament about old age, it's a fact of life. Hopefully, these two projects will speed my transition to a day job working on projects like these. First though, good news on the gardening front. I'm ahead of the game. One third of my tomato plants are planted in addition to my Adventurers in Spring Gardening. I'm on track to have my garden complete by the time I usually start to plant. This is a good thing. More about the rainbow of heirloom tomato varieties later. Second, the Library Seed Bank. This will be a program that I work with public libraries to establish seed banks at the libraries. This will offer open and free access to heirloom and open pollinated seeds, like the knowledge and information that libraries provide. To honor the tradition of libraries, the Library Seed Bank will also have a free education component to it about the value of heritage seeds and seed saving. I will be launching an indiegogo project so I can form a nonprofit to get grants and accept tax-deductible donations. This is a great opportunity, and I hope you will join me as it grows. Pun intended. Third, Cowboy Cab. A friend of mine. Anea Botton owns a social business, Valley Girls Foodstuffs, which she wrote about as conclusion to a 4 part series I did here at Vanishing Feast. The Cowboy Cab as she referred to it in a recent email is a fund-raiser that demonstrates what Valley Girl Foodstuffs is all about. Anea works with at risk teens and uses the pure food system, not the manufactured one, as a way for the teens to develop life skills. I will documenting this in real-time at this fund-raiser. At the event at night I will mentoring a teen who will be the official photographer for the event. I'm excited beyond words about this. I hope to shoot some video too, and will a wealth of content to work with. As I do here at Vanishing Feast, I let the story tell itself so stay tuned and see what this story will tell about itself. I'm impressed with myself. I've never had this much in the ground so early, and my garden plot in such a manageable position. I'm out ahead of the weeds, and I have some rapidly growing tomato plants that will be going in at least 10 days earlier than I planed. Black plastic will go down next weekend, which will heat the soil, and the following weekend they go in. I anticipate that they will be very happy. So that's it for now. I hope your gardens are moving along. NOAA Sea Grant is committed to improving the nation's ability to understand, plan for, and respond to climate variability and change along our shorelines. You can read more about the Sea Grant Program, and see how science serves America's coasts. Science and government, a strong collaboration that benefits all of society. Back to the app. I never thought about a rain garden. My property is too small, and I have heavy shade, so for me it's a few containers crowded for the small spot of light on my porch. I've been fascinated with the thought of rain barrels for a while now, and I have one out at my community garden plot where I need it the most. I downloaded the app and I like it. This app provides all the information you need to plan, layout and create a rain garden. It includes a cost calculator, a data base for searching plants, and videos. The interface is easy to use, it's thorough and it's free. What more could you ask for? Here's the article my friend sent along to me. I hope you'll take advantage of this great collaboration of knowledge, government, science, and nature. Right now it's just avilable for the iPhone, and Android version is slated for re;ases in Spring 2013. Since the organization meeting for my community garden is coming up next week, and my plot will be available, it makes sense that I should get my seeds started. Most of what I grow will be planted after May 15, so I'm still good. Barely. Life happens so I will just go with the flow, and hope for the best. I have a couple new varieties this year, as always and I'm looking forward to what's going to happen with them. The Tabaris bean will be new, which I wrote about a little while back. Toothache Plant or Szechuan Buttons will be new. It intrigues me. I look forward to growing and photographing it. It seems like a beautiful subject to photograph with the leaves described as bronze-purple, and flowers that look like yellow gumdrops with red eyes, it might be a specimen from a garden in Alice in Wonderland. The leaves numb the mouth, hence the name Toothache Plant. There are references for culinary uses, for cocktails, and as a medicinal herb. It's a member of the Asteraceae family, which includes sunflowers, asters and daisies. Sounds like a fun plant. Dragon Carrots, which is vegetable that people rave about, will have a place in my garden. Red skin with orange interiors, and chock full of vitamins, they demonstrate that nutrition can be fun. First and foremost, food is nutrition, and when you can grow fresh, organic nutrition, you should take advantage of it. It's a simple concept. Paris White Cos lettuce is a new to me, but considering Jefferson grew this for 60 years at Monticello, it's been around a long time. It's a French heirloom. I find the French have a nice selection of heirloom lettuces. It's a romaine lettuce, which I enjoy a lot. Green Pear Tomatoes sound interesting. I like green tomatoes a lot. Aunt Ruby's German Green Beefsteaks are legendary, and rightfully so. They have a sweet, spicy flavor that sets the standard for green tomatoes. The Green Pears are fruity in addition to the traditional spicy sweet green tomato flavor profile from the description. Throw in prolific and I'm sold. Wild Galápagos Tomatoes are another tomato that captured my imagination. Anything Galápagos related is fascinating, especially the giant tortoises. I wasn't aware that wild tomatoes grew there until I came across these seeds. The seeds I have are one of two varieties endemic to the Galápagos. They are small, yellow-orange grape shaped, and because of their resistance to a number of tomato pests including the whitefly, and resistance to salt. plant breeders use them as source to cross with other varieties. It all sounds great but the key for me, I have a connection to the giant tortoises. In Russia the Trifele varieties of tomatoes (of which there are several colors) are highly prized and command big prices. Where the Japanese in the name comes from I can't find a source for that because of the above sentence defines the tomato on the Google. I did find a source for the red, pink, and yellow Trifele varieties, Amishlandseeds.com, scroll through this interesting collection of Russian varieties to find them. Gotta love looking at Russian tomatoes with Japanese in their name on a website called Amish Land. A rainbow indeed. Black tomatoes are some of the most flavorful around. These are compact, determinate potato leaf plants that produce all season, and can handle all types of weather from what I read. I'll see if they can handle the oppressive Jersey July humidity. Sungold Tomato seeds were shared with me by Carol Ann, a good friend. They are sweet, early and have notes of fruit. The color is described as orange, tangerine, apricot or gold. I'll take any or all of those colors. They will be a nice contrast with the Green Pear described earlier, and the Black Cherry that I will be growing. And finally, Speckled Roman, also from my friend Carol Ann, who raves about these paste tomatoes. Red with orange stripes, just the name alone makes want to grow them. Speckled has a gesture of humor to me, which I love. They were developed by John Senson of the Seed Savers Exchange, and are said to be a cross between Antique Roman and Banana Legs. I'm excited, fortunate and grateful to share the recent opportunity to interview Matthew Dillon, Director of www.seedmatters.org. I found out about this initiative by the Clif Bar Family Foundation at The 2nd National Heirloom Expo in September 2012. I'm very impressed with the people I met, and with the goals of this program. Matthew was the Founding Director of the Organic Seed Alliance, an organization I have followed for a number of years. I am a big fan of theirs. They do good work, and I encourage you to support them also. Seed Matters we advocate for the improvement and protection of organic seed, which ensures healthy, nutritious and productive crops that benefit people and planet. The relationship of farmers, seeds, public seed research and education is an area that has been co-opted by the push from factory farming, biotechnology and GMOs. Positioning seed matters as an alternative to that existing structure is bold, and demonstrates to me a commitment to leadership. Direct and to the point is sign of clear thinking for a long-term solution, not a fluffy feel good fashionable trend. So without any further ado, here are the Q&As from my interview. What motivated you to get involved with seed saving? In the mid-90s I was farming in Northern California, growing primarily organic vegetables and flowers, and realized that the vast majority of seed we planted was not organic. This struck me as disconnected, and a potential issue with regard to the integrity of organic production systems. Luckily, Sara McCamant (who now works with me on Seed Matters™ Community Seed Toolkits) was the farm manager and a member of Seed Savers Exchange. She saved seed from a number of crops and was well-versed in the issues of concentration in the seed industry. I saw seed conservation as the first step in eventually creating new genetic diversity that would be optimal for organic conditions. I describe it as breeding “the heirlooms of tomorrow.” Working to improve seed systems was what was important to me. I felt we’d lost the knowledge, tools and networks to develop regionally appropriate seed – and this was the issue more than the loss of varieties by name alone. A short four years later I was the Executive Director for Abundant Life Seed Foundation, a nonprofit with 30 years of experience in seed conservation networks. Two years after that I launched Organic Seed Alliance (OSA). While talking to people, I occasionally get feedback that they're not concerned about organic gardening. In your experience, what difference does organic growing make with seeds? Seeds are a product of their environment, and they never remain static. Your grandma’s version of Greyhound cabbage was not the same as the version you grow. It may look basically the same, but it is evolving or de-evolving (moving backwards to a less desirable type) with an ever-changing environment of pest, disease and climate pressures. So, the environment is a determinate in how the future variety will perform (look, yield, resist disease and handle adverse conditions). If you continue to select seed in an environment that includes inputs of synthetic fertilizer, herbicides and such, then you will eventually select for a variety that performs at its best only in the presence of these inputs. And in the long run these inputs are not sustainable, certainly not as sustainable as getting fertility from compost or green manure, or using biological and cultural methods to prevent and treat disease and pests. Reinvigorate public seed research and education. Since seed is a living resource, we talk about it as doing “CPR” on seed. Your work with the Organic Seed Alliance was impressive to me, and I see you're working with them on the Farmer Seed Initiative. Can you please tell me about that program? One of the goals of Seed Matters is to promote farmers’ roles and rights as seed innovators and stewards. If you look at the last 10,000 years of agricultural innovation, farmers have been the prime drivers. For example, there was no production of alfalfa for dairy cattle in the upper Midwest until a farmer named Wendelin Grimm began selecting North America’s first winter hardy alfalfa in the 1850s in Minnesota. There are thousands of anonymous examples for every situation where we actually know by name, place and crop. In the last 100 years farmers have increasingly disengaged from seed work. A number of factors are at play. The advent of hybrid seed is part of it, as is the rise of utility patents that prevent seed saving. But there were also social and economic changes in farming itself that encouraged farmers to be dependent on outside inputs – fertility, disease and pest management and seed. Many farmers are realizing that the more they can be self-sufficient in their inputs, the more resiliency their farms have both ecologically and economically. But they need support – both in re-learning the skills necessary to innovate and in advocating for their ability to engage as seed stewards. OSA does a great job of strengthening farmers’ seed skills – seed production as well as improving crops through basic breeding – and they have a strong advocacy program working to increase funding for participatory plant breeding, protecting farmers from transgenic contamination and working to stop the trend towards intellectual property practices that restrict seed saving. The Farmer Seed Stewardship Initiative is designed to promote and propagate a new generation of farmer seed stewards. The program has both an educational component of training farmers in seed skills and advocating with them as allies. It’s important for farmers to identify themselves as seed innovators so that OSA can leverage their collective voice on state and national issues. There are educational grants available, and the grant to Frank Kutka is very interesting. Can you please elaborate about that? We’re really pleased to be supporting Frank through a Seed Matters grant. He is breeding organic field corn that will reject pollen from transgenic (GMO) crops. The trait is called “gametophytic incompatibility” – plants that have it reject pollen from other plants that are dissimilar to it. It’s an imperfect system – sometimes cross-pollination occurs – but it can help reduce contamination of organic corn from GMO corn. It’s a naturally occurring trait that is being bred using classical field breeding. Frank is sharing his breeding populations with other researchers, and collectively they hope to improve the trait to be more effective in its ability to block cross contamination. What are your thoughts on GMOs? I think they are a temporary technology that will eventually be shown to not produce an adequate, safe or sustainable return on investment. Years from now we will wonder at how much money our federal and private breeding programs threw at them. For the billions that have been spent, we have seen only two traits – RoundUp Resistance and Bt – and both of them are breaking down and failing in the field. Put the allergenic and health concerns people have about these aside for a moment, the simple truth is they simply aren’t working in the field anymore. They haven’t proved more sustainable, and they will be replaced with traits that are even less sustainable. Just because we create a tool doesn’t mean it is a good tool, or that we have to use it. What the private sector loved about this tool is they could commodify it (with patents) and package it with herbicides, and in the short term make a whole lot of money. The companies that were successful are now turning to patenting natural traits since they see their biotech traits are short-lived. It’s this move towards patenting natural traits – traits we want in organics – that we really need to be concerned about. As a blogger, what can I do to help you? This interview is nice. It’s an honor. Thank you. Seed Matters certainly appreciates you sharing our success stories, upcoming campaigns and other information with your readership. We look for guest bloggers too – so if you have a story idea you want to share on our blog – The Seed Commons – let us know. What's your favorite heirloom tomato? Well, as someone who has spent the last 15 years in the cool damp Pacific Northwest, I have almost stopped growing tomatoes due to the difficulty in getting good fruit maturity and the prevalence of late blight. The hybrid Sun Gold did well up there, but as a seed saver I wanted an open-pollinated variety that I could save. Luckily my friend John Navazio, who co-founded OSA with me, started a breeding project making selections out of Sun Gold. My favorite tomato is really that breeding population. Sorry, an experimental population - not an heirloom - at least not yet, but I am confident that when John is finished it will be an heirloom of tomorrow. Thank you Matthew for taking the time to provide such thoughtful and inspiring answers. I hope you are inspired to get involved with seed matters, because seeds, do matter.